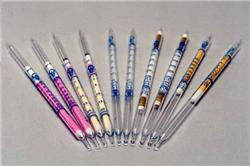 Gastec 75L tert-Butyl Mercaptan Detector Tubes. Detection Range: 0.5-30 mg/m3. 10 measuring tubes per box.